The only real new product since then has been the NESDR Nano 3. It features a new “nano” sized SDR covered with thermal pads on both sides and inside a custom aluminum enclosure. Since the previous NESDR Nano series had serious issues with heat dissipation, I figured it would be instructive to do the same noise floor tests as before and see how it responds. The aluminum enclosure gets pretty hot–seems hot enough to burn. 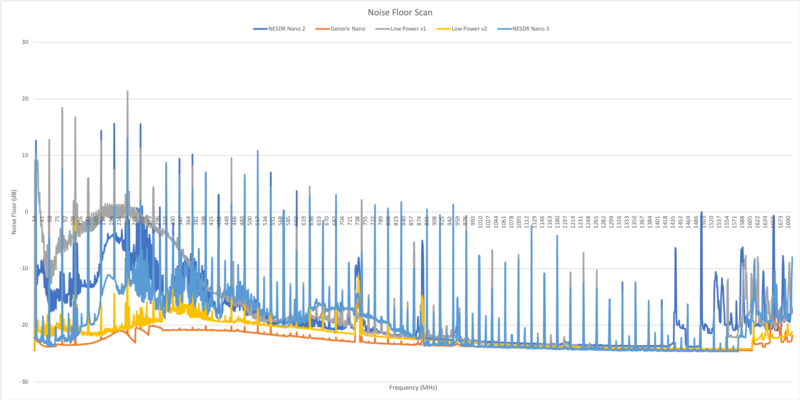 Nano 3 has a lower noise floor than the Low Power v2 from 24 MHz - 110 MHz, then above 890 MHz (except for noise spurs). It was surprising to see the Nano 3 have issues in the 120 MHz-890 MHz range. Low Power v2 has less (and less harsh) noise spurs above 900 MHz. Despite better heat dissipation, the Nano 3 still had issues at 1.5 GHz+. The generic nano SDR is still the low-noise winner.